The information on this web page should be read in connection with Crystallex’s press release of February 16, 2011 entitled, "Crystallex files Request for Arbitration before the World Bank’s International Centre for Settlement of Investment Disputes". Click here to read the press release. 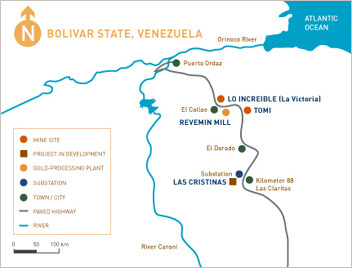 At the end of September 2008, the Company ceased mining at the Tomi and La Victoria mines due to the handover of the Revemin mill to Minerven, a Venezuelan State-owned company, which was effective October 1, 2008. Subsequent to October 1, 2008, the entire mill operating employees at Revemin and some of the mining employees accepted offers of employment with Minerven. The Company paid Minerven compensation for all severance costs relating to those employees who were assumed by Minerven and is in the process of terminating most of the remaining mining employees. In 2009, the Company returned the Tomi and La Victoria properties to the State. The Company is in discussions with MinAmb regarding the extent of its reclamation activities at the Revemin mill. Reclamation studies have been undertaken for the La Victoria and Tomi concessions. The extent of the Company’s reclamation obligations on the mining concessions will not be determined until MIBAM and Minerven determine whether they will continue mining activities on the concessions. Previously, gold was produced from three deposits on the Tomi concession and from an open pit mine on the La Victoria concession. Ore from the Tomi and La Victoria mines was processed at the Revemin mill, which is located ten kilometres from the La Victoria mine and twenty one kilometres from the Tomi mines. In 2008, gold production in Venezuela was 17,885 ounces. 1 Mineral reserves are based on a US$550 per ounce gold price and cut-off grades ranging from 0.33 grams per tonne to 0.57 grams of gold per tonne depending on the mineral type. 2 Calculated in accordance with National Instrument 43-101 as required by Canadian securities regulatory authorities.